Last week, I went to the first CBCA Northern Sydney Sub-branch meeting of the year, at Children’s Bookshop in Beecroft. I’ve been involved with this humble sub-branch since the very beginning, and while I’m a westie, I love being a part of this vibrant group. 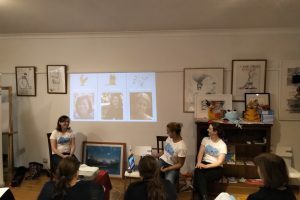 The special guests were the terrific trio of Kate Simpson, Liz Ledden and Nat Amoore who are the hosts of the One More Page podcast. This podcast only started last year, but it continues to kick goals as a kid books lover podcast. They basically gave us a sneak peek of their energy and enthusiasm live in front of us, as they talked about the perks of making a podcast. I’m sure they wouldn’t mind if I share some of them here haha. So if you ever wanted any reasons to start a podcast, here are 5 great perks. A huge part of podcasts is getting interviews and that means you can approach authors and illustrators for interviews. Now don’t think that they’ll say no. Podcasts are the new blogs. I’m sure every author and illustrator would gladly give their time to be on an episode. It’s usually just a phone or Skype call, so it requires minimum commitment for the guests. Each One More Page host made a list of Aussie authors that they wanted to interview, and their wishes have come true! In fact Nat has stolen one of my dreams, talking to Paul Jennings, one of my trinity of childhood authors. Another side-perk is you get to ask questions about the authors’ writing craft and learn from them. 3. You get to build a presence in the kidslit scene. One More Page is more than just a podcast, it has a strong presence in social media with Facebook, Twitter and Instagram. They also turn up at festivals and conferences, I first met the OMP crew at the Sydney Writers Festival’s Family Day. A podcast will also draw people to your own work. All of the OMP hosts love books, Liz is a book reviewer who has her debut picture book coming out, both Nat and Kate are also authors who have new books coming out. So if you are an aspiring author or illustrator, creating a podcast may open doors to publishers and other connections. It’s the best kind of networking. While some people are drawn to the podcast for the content, part of the podcasts’ appeal is the hosts’ voices. The contagious chemistry and banter between Kate, Liz and Nat may have helped earn them a nod for a best newcomer podcast award last year. But even if it’s just you on the podcast, you can still carve a niche by being yourself. Yes, there are a ton of podcasts out there, but you can set yourself apart by doing what you want to do. For example, One More Page has a neat segment where they have kids on the show. They also have animal personas that have become their own plushies…I want that chicken toy haha! 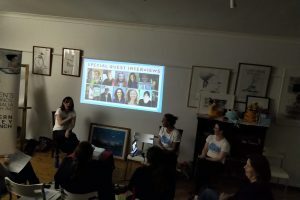 Allison Tait and Valarie Khoo from the Australian Writers Centre also have a nice rapport with their awesome podcast, ‘So you want to be a writer?‘ which is loaded with industry news, tips and insights. They have just passed the million listener mark, and it’s a well deserved milestone. It’s not that hard to start your own podcast, thanks to easy-to-use tools and Youtube tutorials. It is a lot of work, and there will be ups and downs as you juggle podcasting with other things, but once you get into the groove like the OMP ladies, it can be very rewarding. I won’t be starting my own podcast anytime soon, but they all have my love and support (yes that’s an open invite to any future podcasters who want to interview me out there hehe). I’ve always had fun being on podcasts like One More Page, if only to talk about video games or burgers. Mmmm maybe I will start a burger podcast someday…one more patty!